The Goddess Maat is the personification of all the elements of cosmic harmony as established by the Creator-God at the beginning of time-including truth, justice, law, world order and moral integrity. 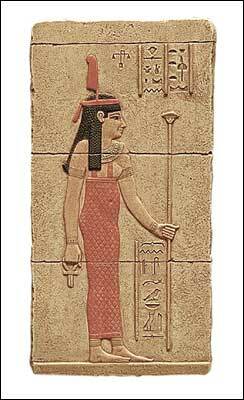 Maat is shown as a lady wearing on her head an ostrich feather. The seated image of Maat was held in pharaoh�s hand like a doll and was presented as an offering to the Gods. This meant that the king was the representative of divine order since Maat was seen as legitimizing their authority to govern and to uphold the laws of the universe which she embodied. Judges were regarded as priests of Maat. In the hall of judgement at the weighing of the heart the heart of the deceased was placed on the scales of justice balanced against the feather of Maat, symbol of justice.